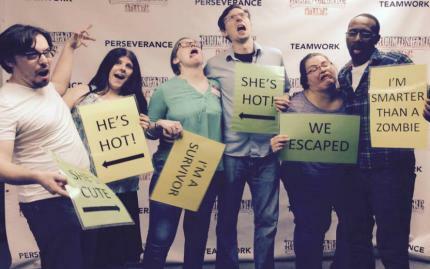 Somehow, you've managed to lock yourself in a room with a group of people and a hungry Zombie chained to the wall. He is not happy, as he has not gotten his daily dose of human -- yet. New puzzles and awesome fun, Trapped in a Room with a Zombie 2 is HERE! There is 1 hungry zombie chained to the wall. Every 5 minutes a buzzer sounds & the chain grows a foot from the wall! Solve the clue and escape…or be eaten. 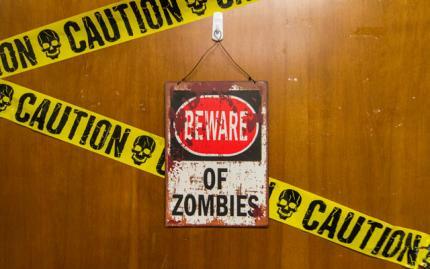 Can you escape this Walking Dead-like scene without getting eaten? Note: If you're under 14 years of age, you must be accompanied by a paying parent or guardian. Trapped in a Room with a Zombie requires 4-12 guests. If you have a party less than 4, it is best to find a time where other guests are booked. You may be grouped with other players unless you purchase all tickets for the time slot. ALL SALES ARE FINAL AND NO REFUND WILL BE PERMITTED IN CASE OF CANCELLATION, MISSED GAME TIME OR NO-SHOW.